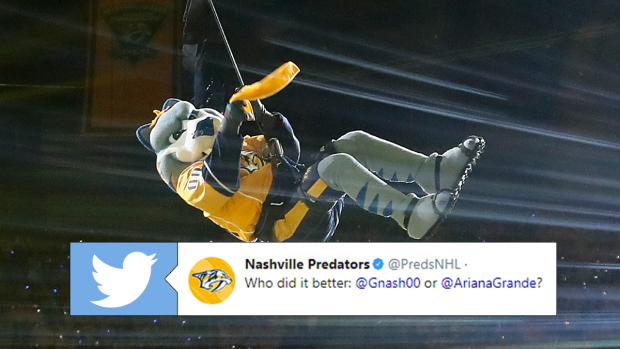 The Nashville Predators mascot might be the most social media savvy mascot in the sports world. Gnash is one of the more popular mascots on social media, because he can get pretty wild at times. In the playoffs, he torched the Blackhawks for their lack of goals in last year’s playoffs. Before that, he called out ESPN writers for their picks after sweeping the blackhawks. This time, Gnash is up to some more peculiar activity. He’s doing his best impression of Ariana Grande’s new album cover. This may seem totally bizarre, but there is kind of an explanation: Blame the internet. The internet makes people do crazy things and who is more prime to fall for it’s tricks than someone who is basically a modern day jester. Mascots are entertaining and at the moment, there’s not much more entertaining than the internet – which is where the latest trend comes in. Jesse McLaren tweeted the joke above on Sunday, and since then, people have constantly been trying to reenact the photo that was taken – in order to prove whether or it’s photoshop because the haters are definitely saying it is. However, judging by not only Gnash’s photo, but many others, this looks like it’s totally possible and not at all photoshop. There are even more photos from Grande’s photoshoot that make it unlikely that one particular shot would be fake.